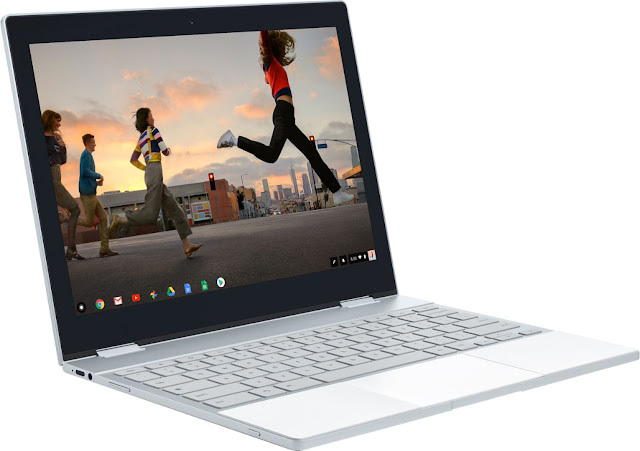 For all the tech lovers, here is the new high-performance Chromebook and Pixelbook Pen1 - Google Pixelbook. This is a beautifully versatile and Google's thinnest laptop ever. Can you believe it is just 10.3mm? The lightweight aluminum construction makes it easy to carry anywhere. Powered by Chrome OS, it has the latest security and software features. There is a lot more to this wonderful Pixelbook. Read ahead! This is the first laptop with the Google Assistant built in2, so you’ll be able to get more done faster and smarter. The Google Assistant key is available on the keyboard thus making it easily accessible. If you are familiar with “Ok Google” wake word, you can use that too! You can even access it with Pixelbook Pen1 by simply pressing and holding the button, then tap the pen on Pixelbook’s screen to get help from your Assistant. With a 360° touchscreen and versatile 4-in-1 design, you can use it as per your convenience. You can sketch or edit photos, stay productive with GSuite apps that drive automatically backs up to your device5, and enjoy on-or-offline access to movies and TV shows with apps like Google Play Movies and YouTube Red. Be it work or play, this smart, responsive stylus is designed to enhance whatever you choose to do. You can buy your Google Pixelbook right now at Best Buy. There is an offer to save $100 from 3/25 - 4/7. So hurry up and grab the deal! In addition to the above wonderful features, Pixelbook starts up in under ten seconds and has a fast-charging, all-day battery that gives up to ten hours of go from a single charge. There are many great apps for work and play including Google Drive, Docs, Sheets, Slides, Gmail, Photos and more. You can always download your favorites from YouTube Red and Google Play Movies to enjoy even without Wi-Fi. Pixelbook Pen is sold as a separate accessory, subject to availability. Head over today to Best Buy to save $100 on Google Pixelbook!